It’s becoming clear that the technology of traditional enterprise networks can’t keep up in the era of cloud, IoT, and an expanding network edge. For enterprises to thrive and compete in the digital age requires a network capable of agile and boundless connectivity. These and other challenges have paved the way for SD-WAN for enterprises since it’s built for the on-demand cloud era through its use of software, virtualization, programmability, and automation. It’s fast becoming the network architecture for today, and the future, as its demand and adoption has increased across enterprise sectors. We found SD-WAN infrastructure and services will reach a compound annual growth rate (CAGR) of 69.6 percent and reach $8.05 billion by 2021, from IDC’s Worldwide SD-WAN Forecast: 2017-2021. Cost management is considered by many to be the low hanging fruit of SD-WAN architecture benefits. The fact is that CAPEX hardware reductions and reducing the need to replace networking components every 3 to 5 years is a huge cost savings. Things look tremendously better when you add reduced OPEX from the centralized configuration and management. This eliminates the need for skilled, on-site resources in Branch locations, which can deliver huge annual savings to the enterprise. SD-WAN architecture ushers in faster provisioning by eliminating manual, error-prone box-by-box configuration. Instead, algorithms that instantly distribute policies and parameters make automatic provisioning a reality. The result is a provisioning process that goes from days or weeks to minutes along with delivering infinite routing choices that aren’t bound by network conditions. By decoupling the data plane from the control and management planes, you can set up central control of network-wide policy and security from the branch to the cloud. The same is true for user-based identity access controls where network zone assignment for user groups simplify enterprise network security and management across all devices and locations. Network segmentation with SD-WAN reduces attack surfaces while the ability to deploy VPN as a software overlay enables end-to-end encryption. This helps meet any high security or other regulatory compliance security requirements across the network. The ability to dynamically use all of your different connections (MPLS, Internet, 3G/4G) to handle traffic based on priority, point of origin, and destination can have a major impact on improving bandwidth management. That can mean configuring high priority traffic over the resilient MPLS link while sending secondary traffic on the broadband circuit. SD-WAN architecture delivers load balancing between multiple transport circuits, which effectively utilizes all of the bandwidth linking each branch. SD-WAN’s cloud-ready nature enables access to all parts of the network through a centralized control panel. This ensures that enterprises can remotely configure and manage multiple locations. 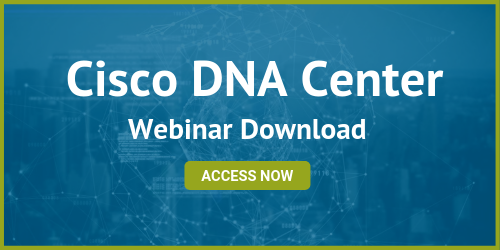 SD-WAN provides robust performance monitoring and troubleshooting that can track network use and availability data as well as sites, servers, applications, and users. With policy validation and fast troubleshooting as hallmarks, network administrators can keep the SD-WAN environment operating as intended. Your enterprise’s network must be capable of immediately responding to changing operational needs in real time to compete in the digital age. 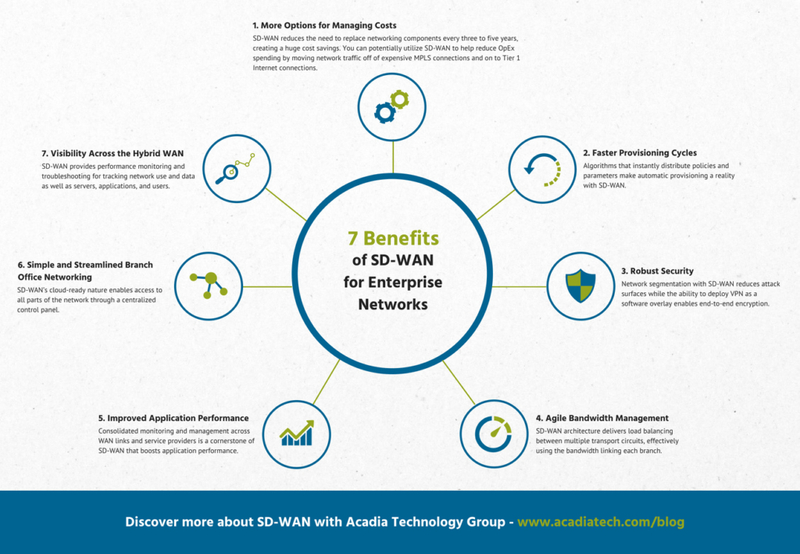 With Acadia Technology Group as your networking solution design specialist, SD-WAN for enterprises can provide the agility you need to meet the increasing demands on enterprise networks for both innovation and security. 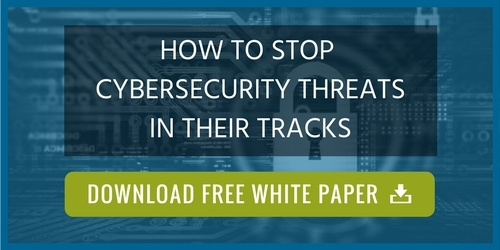 To learn more about emerging security threats in 2018, download the free white paper.